Our Prenatal Core Training approach recommends the use of an abdominal splint during pregnancy to reinforce the internal corset muscle. This can help alleviate common pregnancy-related aches and pains such as back pain, hip pain, abdominal pain, sciatica, SI joint instability, and much more. Abdominal splinting is highly encouraged to support optimal fetal alignment. This puts the least amount of unbalanced stress on your body and sets the stage to place effective pressure on the cervix to stimulate and intensify contractions, therefore steadily progressing labor. The Tummy Team recommends *intermittent abdominal splinting during pregnancy in conjunction with our Prenatal Core Training program. Women often begin their pregnancies with a functionally weak core and, as a result, develop diastasis recti and other pregnancy-related pain. 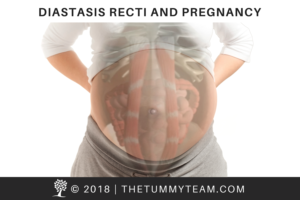 Diastasis recti is a separation of the abdominal wall due to consistent forward and forceful pressure. It is especially common in prenatal women because the growing uterus puts pressure on the abdominal wall. This, combined with relaxin and other hormones, creates an increased laxity in the connective tissue of your abdominals, the linea alba. Using an abdominal splint during pregnancy can help reverse your diastasis recti during pregnancy by bringing the two sides of the separated abdominal wall together, placing the connective tissue in a lax position to speed up healing.